As you look out our front window here on the Lower South Fork of the Shoshone River, which faces southwest, you see the famous landmark, called "Castle Rock" about three miles away. It juts up from the valley floor and stands all by itself. It rises several hundred above the floor of the valley. "Castle Rock" actually climbs to 6,010 feet (1,831.85 meters) above sea level. Here at the ranch we are about 5300 feet above sea level to give you an idea how high it is. As the "Castle Rock" sign says: "John Colter, famed among the famous breed of Mountain Men, passed this landmark late in the fall of 1807 while on business for the fur trader Manual Lisa. Searching for Indians in order to conduct trade, he also hunted salt caves reputedly located near the headwaters of this stream then known as the 'stinking water.' On his journey, Colter not only discovered this later named Shoshone River but he also became the first recorded white man to visit the upper Wind River, Jackson's Hole and Yellowstone Park. 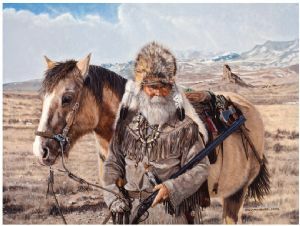 His lonely trek, compounding the normal dangers of savage wilderness by mid winter passage of a broad and lofty mountain range, lives in history and legend an epic of fortitudinous exploration." There is a lot of other history that is based around this famous landmark. To this day, you can still see the original "teepee rings" around the base. Description: Leigh and I had the extreme pleasure of meeting a man, well known and well loved by many here in Cody. His name is Sheldon Hanson. He is 70 years of age. Sheldon actually lives right across the river from "Castle Rock." The piece 24" x 18", traditional oils on Masonite. Original is SOLD.